Once again, I'm turning to Paula Deen, my favorite, for a fabulous recipe. I was recently watching Paula's Home Cooking, and she made these little gems. As I watched her make them, I kept thinking "How can these not be good??" Seriously, whats not to love? 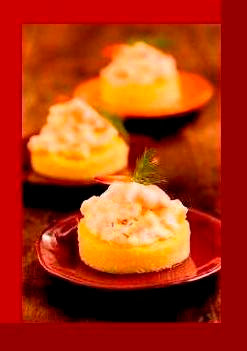 I also figured they'd be perfect for the Holiday Entertaining theme since they're clearly easy to make and simply elegant. In a large bowl, combine cream cheese and half-and-half, stirring until combined. Stir in cheese, parsley, and shrimp. Top each grits round evenly with shrimp mixture. Top mixture with grated cheddar cheese. Broil 5 minutes, or until lightly browned and heated through. It seems to me that you could just cut the grits into small squares if you don't have time to cut them into the small rounds. This would also insure that you use all of your grits, rather than having scraps left from cutting circles.